The Gospel in Year B is from Luke, which describes the life of the Holy Family, a life of prayer, love and obedience. In holy fellowship the Three go to Jerusalem, to God's Temple, to sacrifice to the Most High, singing in their hearts: "One thing I have asked of the Lord, this will I seek after, that I may dwell in the house of the Lord all the days of my life." This spirit of prayer and sacrifice they take back to their little home, preserve it until the day when they return to the Holy City to renew and deepen it. Furthermore, the Gospel shows the holy love which unites Mary to Joseph and both to the divine Child. "Behold Thy father and I were seeking Thee sorrowing." A loving seeking of the Beloved! And how touching are the few but significant words: "And He was subject to them." 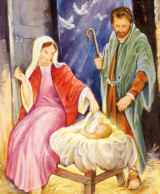 The Son of God subject, obedient to Mary and Joseph! The virtues reigned supreme in the first Christian home. There is mercy, benignity, humility, modesty and patience. But above all these things, there is charity, which is the bond of perfection. There the word of Christ dwells abundantly in all wisdom. There continuous thanks is given to God, the Father of our Lord Jesus Christ. A splendid pattern for everybody! "Truly to fathers of families, Joseph is a superlative model of paternal vigilance and care. In the most holy Virgin Mother of God, mothers may find an excellent example of love, modesty, submission of spirit and perfect faith. Whilst in Jesus, who was subject to His parents, the children of the family have a divine model of obedience which they can admire, reverence and imitate . . . The rich may learn that virtue is to be more highly esteemed than wealth. Laborers, and all who are seriously straitened by their slender means of subsistence, will not lack reason for rejoicing rather than grieving at their lot. In, common with the Holy Family, they have to work, and to provide for the daily wants of life" (from Leo XIII). Lord help us "to order our lives after the example of the Holy Family, that with Jesus, Mary and Joseph we may obtain everlasting fellowship" (text from the old collect ). — Adapted from Vine And Branches, Vol. One by Martin B. Hellriegel, ©1948, Pio Decimo Press. This feast is celebrated soon after Christmas Day, for it was the Holy Innocents that took the place of the Child Jesus by shedding their blood instead of His. The Holy Innocents are the special patrons of small children. Parents can teach their children to pray for help in obeying their parents, sharing their toys, loving their siblings and playmates. Parents have the privilege of blessing their children. Today have a formal ceremony using the form from the Roman Ritual old form or from the Book of Blessings or from Helen McLoughlin's suggested prayers and blessings: Holy Innocents or Childermas Day: Parental Blessing of Children. The family should take time especially today to pray together. The rosary, especially the Joyful mysteries, is an excellent family prayer. If the family is too young to say the rosary, choose the Fifth Joyful Mystery, the Finding of Jesus in the Temple and talk out loud about this event with the Holy Family. Explain the cultural reasons why Jesus would be lost: the "family" traveling was the whole clan, and men and women would travel in separate groups, but the children would be free to be with either parent. Find out how many days' travel this would mean, on foot. What would they eat, where would they sleep, how do you think Mary and Joseph felt losing their Son? What is the significance of Jesus "listening and asking them questions"? What does it mean when he said "I must be about my Father's Business"? An excellent book that meditates on the life of the Holy Family is Family for Families by Father Filas. Excerpts could be read aloud at the dinner table during the Christmas season. Also the Prayer of Consecration of the Family to the Holy Family, Prayer of Parents for Their Children and Prayer to the Holy Family can be said on this feastday as a family. Plan a family dinner, having all the family members getting involved. Each member can plan or choose a favorite dish (depending on the age). From Elsa Chaney's Twelve Days of Christmas comes the suggestion of a centerpiece made by "surrounding the Christ-Candle with smaller white candles representing the Holy Innocents. The number of small candles might be as many as there are children in the family. Each child is allowed to light one small candle from the flame of the Christ-Candle, signifying that inasmuch as he received his life from Christ, he will live and if need be die for Christ just as the Holy Innocents did." Before or after dinner, have family activity such as games, movies or an outing (ice skating, sledding, walk outdoors). If you prefer to stay indoors try making popcorn balls, an activity that can get all hands involved from young to old.